Cynthia please tell us about your professional background? I joined Enbridge in 1999 and after a short period in finance, moved into operational roles including compliance, maintenance, health, safety, environment and field operations. In 2013, I became Senior Vice President of Safety and Operational Reliability. In this role, I set up the enterprise team that supports our safety culture development and enterprise standards and programs. I became the President of Enbridge Gas Distribution in 2016 before moving into my current role as Executive Vice President of Utilities and Power Operations, aligning with the corporate merger of Enbridge and Spectra. How has the merger with Spectra impacted EH&S? This was a very significant merger and going through the due diligence process was critical. That process raised the question: ‘How do we look at the operations of these two large entities in North America?’ Our initial evaluation found that both companies had very strong safety cultures and what we have seen since the merger is that this has held true. In the midst of lots of change we’ve had a strong foundation to build upon. We begun shortly after the merger, by aligning around a common set of values: integrity, safety and respect. This alignment was critical within our process. We created the opportunity to have both companies’ safety and operational reliability teams lead us through an evaluation of our HSE practices. For example, we now have common life saving rules based on consistent health and safety principles. Recently, we announced that our enterprise Safety and Operational Reliability team will move to a shared services model to enable further alignment. We realized that some of our resources were more distributed within our business units and this shift will be critical to enable an absolute focus on safety and operational reliability. The term operational excellence (OE) is used widely in industry nowadays. 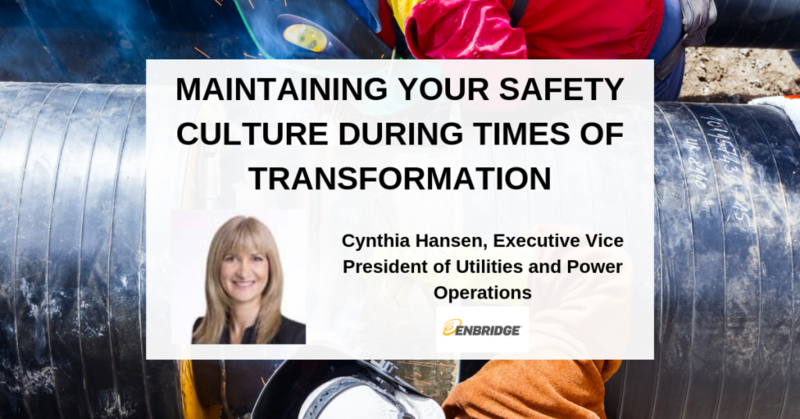 How are continuous improvement and OE defined at Enbridge? We have components of operational excellence embedded in all of our practices, whether that’s safety, operations, engineering or our integrity management program. Across Enbridge, we have an integrated management system that ensures complete alignment of our approach to OE. That alignment starts at the top of the organization. We have a safety and reliability committee of the Board of Directors where we share critical areas of focus and our results in those areas. Safety and safety culture is a critical part of this platform, but to deliver that we need to focus on operational excellence, and ensure we’re innovating by undertaking research and development and incorporating any findings with our approach to safety and reliability.